Plowing away | arlette knits. I am on my last test knit for awhile. I have promised/blackmailed myself into not knitting anything that isn’t from one of my own patterns for a bit, and that means no test knits no no no don’t even look into those groups unless you’re posting things yourself. it’s gotten to where I have pages and pages of sketches and patterns mostly worked out or half-finished or just in need of testing, and I’m starting to feel like a sham for posting on designers’ groups on Ravelry, and I miss working in InDesign so much that it hurts. 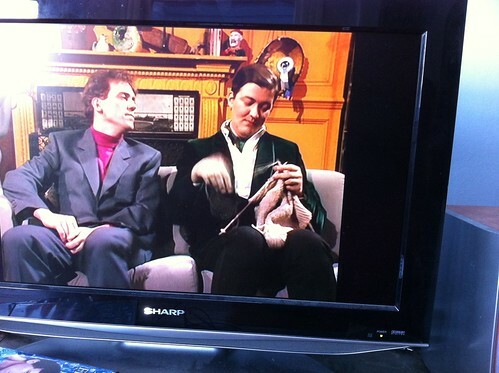 Knitting to Fry and Laurie, and Fry is knitting back! So: more movies, more knitting, more sitting still. More doing. More MAKING! Previous PostRelocation and intermissionNext PostLike knitting with an earthworm made of kittens!